Should we fence all rivers to protect toddlers from slack parents? The Dominion Post devotes half this morning’s front page to the bleatings of a drowned toddler’s uncle that the council should have fenced the river in which his 2 year old nephew drowned. A family hit by a drowning tragedy had repeatedly pleaded with the council to build a fence where a toddler died. Sukhraj Singh, 2, died and his cousin Archilles Kaui, 3, remains in hospital in a critical condition after the pair wandered into Gisborne’s Taruheru River on Thursday. “I’ve been asking myself all night, would this have happened if the fence was put up in our neighbourhood? And the answer is no. Because those toddlers would not have been able to get past the fence”, Sukhraj’s uncle Hemi Jahnke said. Before the tragedy, Archilles’ mother, Diana McIntyre, had been visiting Sukhraj’s mother, Jamie Taewa, at her home in Atkinson St. It was thought about 10 to 15 minutes passed before the women noticed the two toddlers had wandered off. Well sorry, but any mother who lets a toddler out of her sight for 10 or 15 minutes near a river has no one to blame but herself if the child drowns. That’s a hard thing to write at this sad time, especially as the poor mother may well have arrived at the same conclusion and does not necessarily share the uncle’s view. But for the uncle to blame the council (ie the rest of us) is outrageously unfair. Members of the family were part of community group Kia Kaha Mangapapa, a charitable trust started to try to make a positive difference in the area. The idea of a fence at the reserve was brought up at several hui called with Gisborne District Council last year. Archilles’ parents, Ms McLean and Frank Kaui, attended one of the meetings. Mr Jahnke said the council had agreed to put up the fence. He was angry with the council. “How many lives have been lost in river accidents because the council says they haven’t got enough money? Damn right. And I think most of us have a fair idea who. Gisborne District Council acting chief executive Nedine Thatcher-Swann said it was “inconclusive” whether fencing the reserve would have made a difference at this stage. Fencing every waterway into which a poorly supervised toddler could wander would certainly make a huge difference to the amount of public money available for other services. Or to Gisborne residents’ rates bills. In my view the Council did exactly the right thing in refusing to assume the role of parents. And so it should be. Do we really want to turn our country into an unsightly baby-prison, just so we can protect our toddlers from slack parents? I grew up in a house near the Waiwhetu Stream in Fairfield, Lower Hutt. The Stream got a bad press for being badly polluted down the industrial end, but the suburban reaches were and are a delightfully meandering waterway that greatly enhances the ambience of the area. It remains unfenced, despite being bounded by houses for miles, and is dotted with reserves, also unfenced. Presumably, parents who choose to live there, like mine did, also take responsibility for watching their children. I hope the Dominion Post will reflect on the message their story sends, and provide some balance in the coming days. After a determined bid to defeat medical science, Dad breathed his last on Monday, exactly four weeks after his stroke. This is my first experience of losing a close family member — a prospect I’ve been dreading for years — and I must say I’m feeling better than expected. Perhaps it’s knowing that Dad is free of pain after living a long and happy life. Perhaps it’s the relief of seeing Mum coping so bravely with the loss of her husband of 55 years. Or perhaps it’s the long period of adjustment that a bedside vigil affords you. Whatever the reason, the experience has drawn our family closer together and we look forward to giving him a good sendoff on Friday. Despite my earlier reservations about the pill that cost him his life, it’s been a privilege to witness the dedication of the doctors and nurses at Hutt and Wellington Hospitals, who cared for him like he was one of their own. That’s all you can ask for in the end. You may have seen this article in the last Sunday Star-Times about the lethal side-effects of new blood thinning ‘wonderdrug’ Pradaxa (AKA dabigatran). In today’s edition, there’s another story of a Pradaxa victim in Tauranga fighting for his life. Sadly, I have a good idea of what this man and his family are going through. The reason I haven’t been blogging is that for the last three weeks, my 91 year old dad has been fighting the same fight, after taking the same drug. A couple of nights ago, a doctor told us he’d be surprised if Dad had more than a few hours to live. There’s only so much battering a 91 year old body can take from the combined effects of a bad stroke, pneumonia, blood loss, incontinence, bed sores, and the repeated invasions of various body parts by various tubes. All caused by a ‘wonderdrug’, taken once. While the transfusion machine pumped the fresh blood of some generous unknown donor into the repeatedly punctured veins of his purply-black arm, we called in the family, gathered round his bed, and waited. With insight gained from his wife who nurses the dying, the young registrar predicted that the life or death call would be made by Dad himself. Luckily, some time in the wee small hours, he chose life. Late the next morning, oblivious to our anxiety, he awoke refreshed from the deepest sleep he’d had in weeks. I told him the doctors were surprised he was still with us. His raspy, oxygen-assisted response was inspirational and unforgettable. As himself, my father was not the gloating type. He was a gentle man in every sense. Some med students trooped past his room. I explained to Dad that he was now in a teaching hospital (Wellington, having been transferred from Hutt in an ambulance the previous day). Dad started teaching doctors about the will to live in 1919. For him, the Twenties were more wheezing than Roaring. It was by no means certain that his weedy, sunken-chested, asthmatic body would make it through to enjoy the Great Depression. 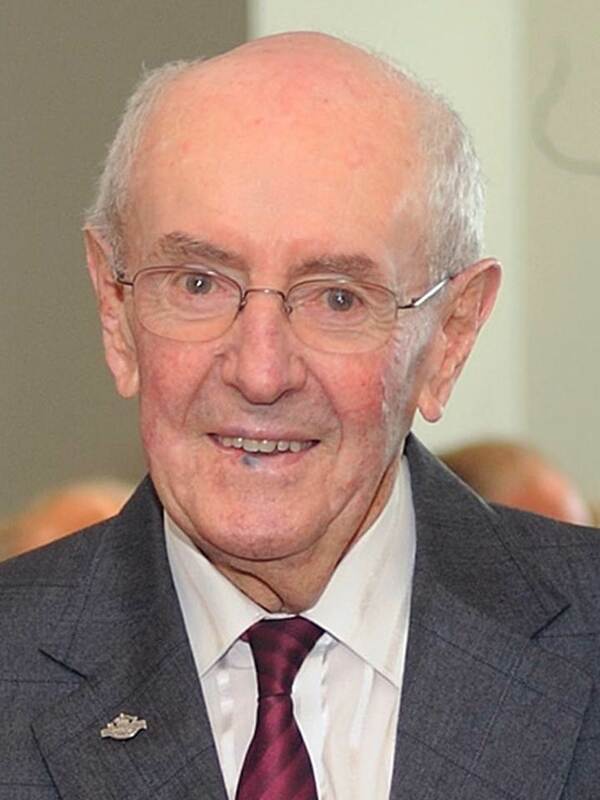 He first listened to his beloved All Blacks on the radio in 1928 — a ritual I was to repeat at the same age in 1967, propped up in his and Mum’s bed. To suggest in the 1920s that this sickly kid would one day watch his team contest the 2011 Rugby World Cup would be to invite admission to one of Her Majesty’s lunatic asylums. Yet for the best part of 91 years — until 6.30am on 5 September 2011 — Dad was true to his name: Vivian — full of life. On his 90th birthday he invited everyone back for his 100th, and fully intended to keep the appointment. His gym-going was as religious as his church-going. And he did. A few months ago, he published that book. Now he can’t read one. Two weeks ago, he managed to watch half of the All Blacks-Tonga match before drifting off, but not before confidently asserting that the final score would be 42-9. Last night, he couldn’t be bothered watching the All Blacks play France on the TV staring him in the face. One little dose of the ‘wonderdrug’ was all it took. One pill. On the Wednesday, he was taken off his warfarin. At 5.30pm, he swallowed his first and only dose of dabigatran. By 9.30pm, he was feeling so weird and disoriented that Mum had to call an ambulance. The next day, his doctor put him back on his warfarin, but by then the ‘wonderdrug’ had done its worst. At Father’s Day dinner on the Sunday, he told me he’d “had a bit of a setback”, the first I heard of the above. The next morning, Mum awoke to the thump-thump of Dad hitting his head on the bedside furniture, and his body flopping on the floor. He’d had two small strokes in 1998 and 2005. But this was a biggie. Into Hutt Hospital by ambulance, fortunately to the Wellington region’s only dedicated stroke unit. And the staff are dedicated too. They just can’t be there all the time. Neither, sadly, can we. He can’t swallow, so has to be fed through a tube. In the delirium brought on by the stroke, he keeps trying to pull the tube out, and all too often succeeds. For the last few days we thought we had him tamed, but this morning when the watching nurse was distracted, he yanked it out again. Each time he does this, he has to endure having a long plastic tube inserted up his nose and down his throat into what we hope is his stomach, but is sometimes his lungs. Then they have to do it again. Once it came out his mouth by mistake. Every time they put the tube back in, he has to be X-rayed to check the food is going into the right cavity. I’ll spare you the details of the other orifices. Suffice it to say that, at times like this, it’s a shame we have so many. We don’t know how this story will end, or when. If you can spare a thought for a 91 year old man who’s led a good life, his sub-conscious would, I think, be pleased to hear from you. This graph from ACT’s Roger Douglas illustrates John Key’s duplicity in first helping to cause, then pretending to care about, youth unemployment. National, Labour and the Greens — all parties bar ACT — voted down Roger’s bill to reinstate youth rates and get kids off the couch and into work. By refusing to allow kids to be paid less than adults, Key deliberately allowed the number of young unemployed to double. Now he’s offering a dollop of your money to any boss who pays a kid an adult’s wage. Why not just let the boss pay the kid a kid’s wage, and let the kid work their way up — the way most of us did? Excellent graph, whoever did this. My ACT ad that contained 40 statements of fact has been cleared by the Advertising Standards Authority. 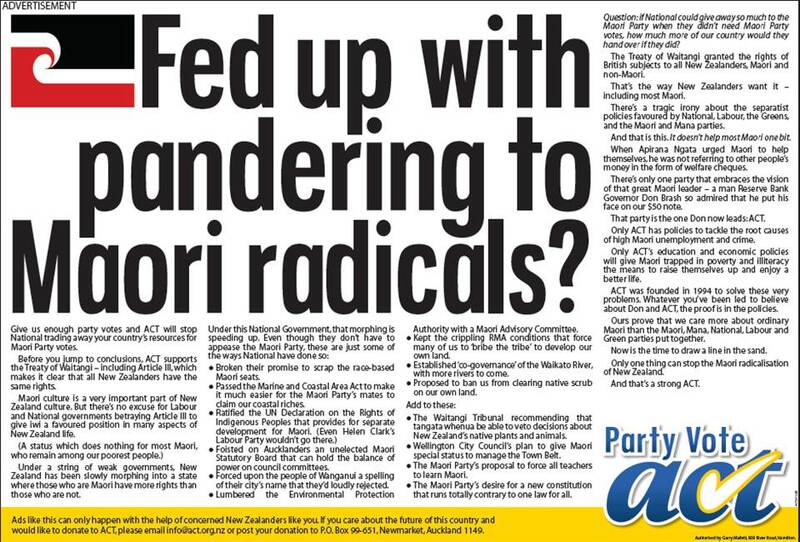 The Advertising Standards Authority has rejected a complaint about ACT’s controversial “Fed up with pandering to Maori radicals?” newspaper advertisement. Twelve people argued the advert was “misleading, offensive, racist, in breach of the requirement for a due sense of social responsibility and likely to play on fear”. The ASA said a political party advocating a robust view on matters of public interest allowed the public to see the party’s position. There was no breach of codes and no grounds for the complaints to proceed, it ruled. Yet the Dominion Post refused to “allow the public to see the party’s position”. But the public also has the right to know that the capital’s daily newspaper is politically biased against ACT. What sort of democracy do we live in when a monopoly newspaper can be so cravenly politically correct as to ban a question that most of its readers would answer Yes to, backed by 40 true statements? What is it about Wellington and its circular landmarks with eccentric nicknames? The under-50s won’t remember when the twin-domed Welsh Dragon Bar in the middle of Kent and Cambridge Terraces used to be a public toilet block, known by all as the Taj Mahal. At the far end of the same dual-dragstrip is the Basin Reserve, so named after the 1855 earthquake turned Basin Lake into a swamp, which the council then turned into a sports reserve. Over in Thorndon there’s the parliamentary Beehive, which Sir Basil Spence designed on the back of a serviette. And the Cake Tin, named by yours truly in response to a call for a nickname by the Evening Post’s Angus Morrison. And now we have a new stadium to name: the Kilbirnie Indoor Sports Centre in Evans Bay. It’s not quite circular, but near enough. Like the Cake Tin, the new Kilbirnie Indoor Sports Centre is a good example of smooth, single-minded design. I worry that the architects’ favourite, The Limpet, while anatomically accurate, might be a bit, well, limp to catch on. So what about the Saucer (as in flying), the Clam, the Oyster, the Stingray, the Flounder, the Slater or the Frisbee? A friend of mine argues noisily for The Trilobite, a creature I had not heard of, but which it clearly resembles. But the nickname with the best combination of stickability and seaside relevance would have to be the Turtle. What do you think? Feel free to suggest a name of your own. I may run a poll of the best of them. But to me, if I squint as I drive round the bays I see a beached, bleached white turtle shell whose occupant is wisely staying indoors. 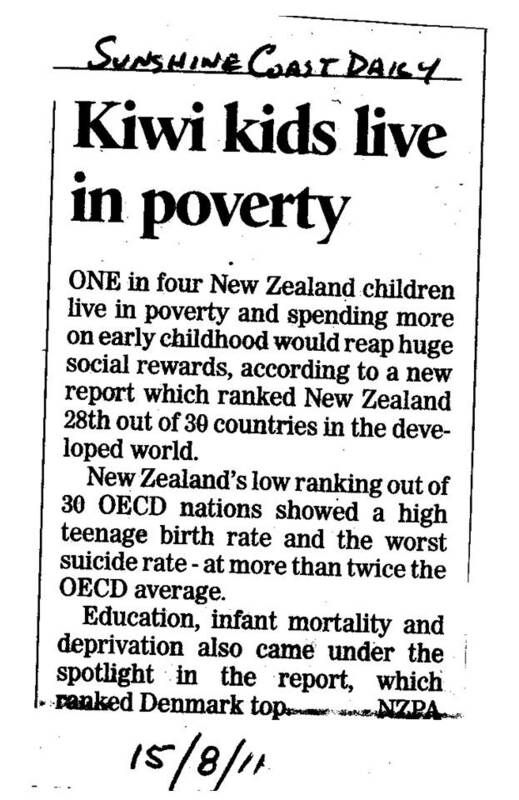 The Tasman wage gap, which John Key once pretended to want to close, is also a poverty gap. Here’s how it’s being reported in Australia. Of course, setting the poverty line at 60% of median income is a typical lefty linguistic trick. Poverty is starvation. Being only 60% as rich as the averge person is envy. Thanks Ross for sending me this clipping.